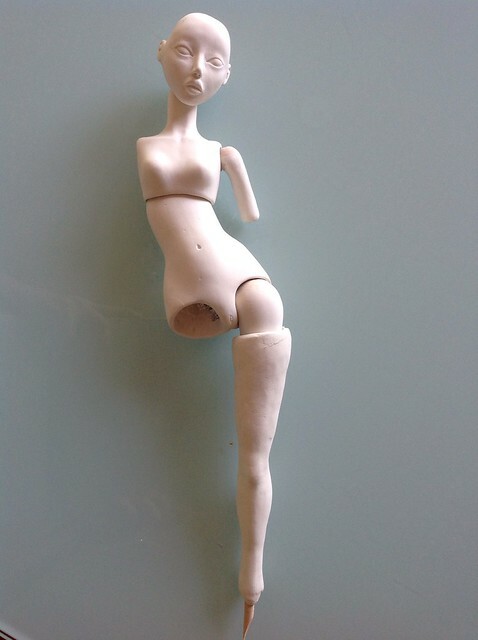 I started to make my own doll about one and a half year ago -something like that- and I have started again and again and again.... never happy with the size or with the material I used etc. First attempt. Hated this polymer clay so MUCH!!! (original sculpey , very soft stuff and therefore drove me nuts) and the size of this doll was going to be too small, so off it went. This was the first porcelain doll I actually finished -well, not totally, this one is painted with acrylics and not with china paint. And it is strung with elastics. Some of the mess involving doll making . 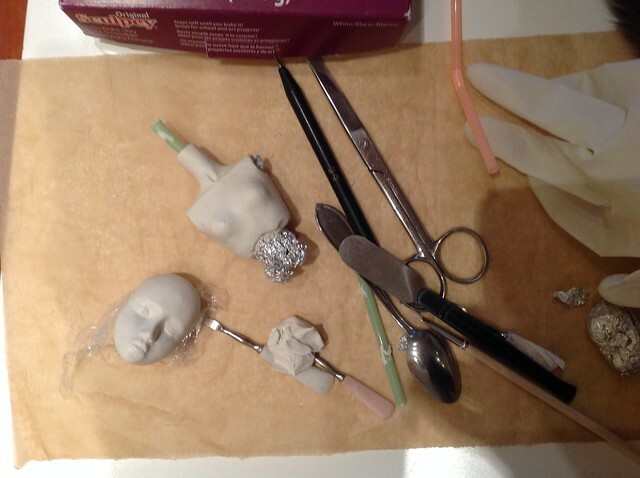 And I am so happy with the SuperSculpey stuff -million times better than the OriginalSculpey!! 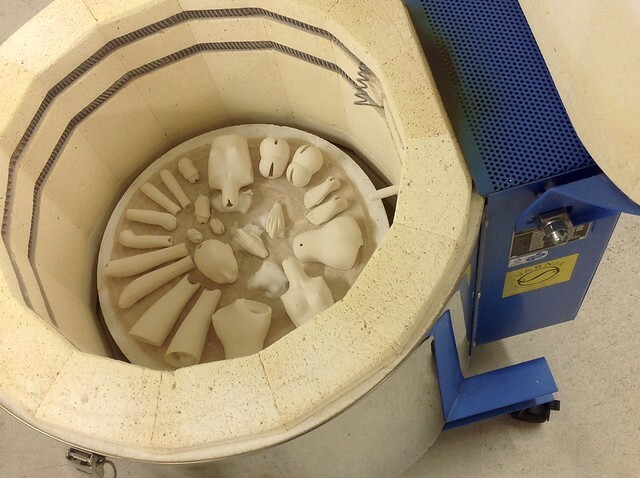 I was able to buy a used kiln with very reasonable price and I didn't anymore have to use the kiln in a school , where all the other people were doing stuff from clay and the temperature was never right for my porcelain stuff. This doll is now actually assembled -not painted though, since I will not paint this doll at all, I am just experimenting how the joints actually work and how to string with springs and swivels. Shall post photos when I have time to take some and load them to computer. Not perfect and some joints maybe have to be done all over again -but at least a start. A really good start...! She looks great. very beautiful! I can tell you've put a lot of work into her! Her joints look great, I especially like the double hip joint. Can't wait to see more pics of her! She's looking great! I bet you can't wait until you have strung her so you can have a really good play! Caracal, amazing work. Your doll coming along very well. Can't wait to see her when she is all done. 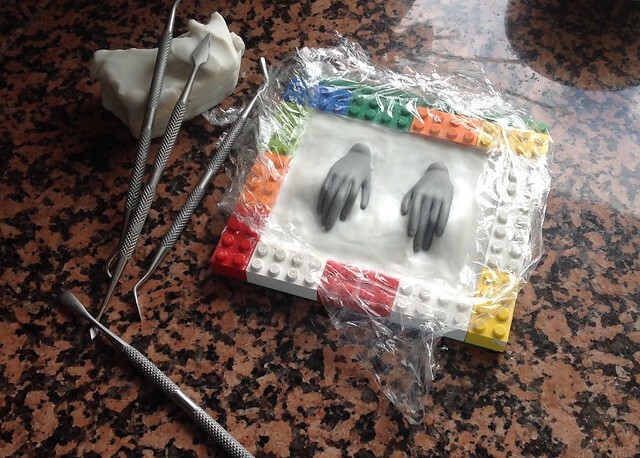 I have now done couple molds all over again and made hands smaller too. At the moment I am waiting parts to dry, so I can fire them and maybe finally I would have parts to paint with china paint. My friend who has a shop/boutique has already asked if I could make couple girls for that place . So excited about that project! 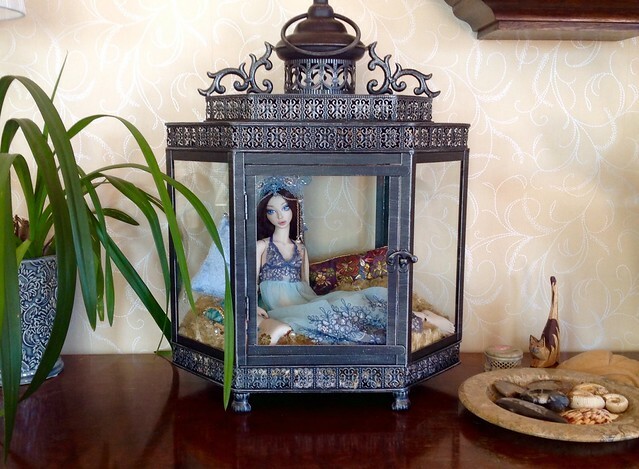 Although, I can not make very bling bling clothes for those dolls, because that would not go with the athmosphere of the shop -so those girls will have very earthy tones. How exciting that your friend wishes to model them in her shop! I hope you find some more porcelain slip too, so you can finish soon! Looking forward to seeing more progress pictures. wow!!! everything looks amazing,well done to you! Caracal I'm really looking forward to more developments for your girl! She will be an amazing addition to any shop and I hope you will share the pictures with us! And no, I haven't found light colored porcelain slip near me -not much of any in Finland . 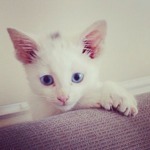 I am in trouble! Painting -had some difficulties since porcelain painting is a new thing to me..
And I did finally get one girl painted and assembled! There are things I want to still change/remake and I need to do new face at some point, getting bored with this one. Caracal! Amazing! I cannot believe how great they look And you make amazing stuff!! 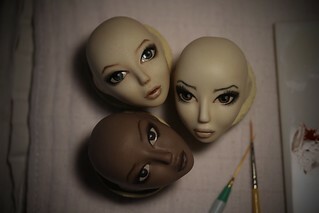 Hahaha <3 I hope you do keep working with porcelain The girls look fantastic, and with all your amazing seamstress skills I can't wait to see your very own dolls wearing some of your own fashions!